This 1964 production of Thackery’s ‘Fireside Pantomime for Great & Small Children’ was first performed by the Drama Club in 1959 – with some members being involved in both! 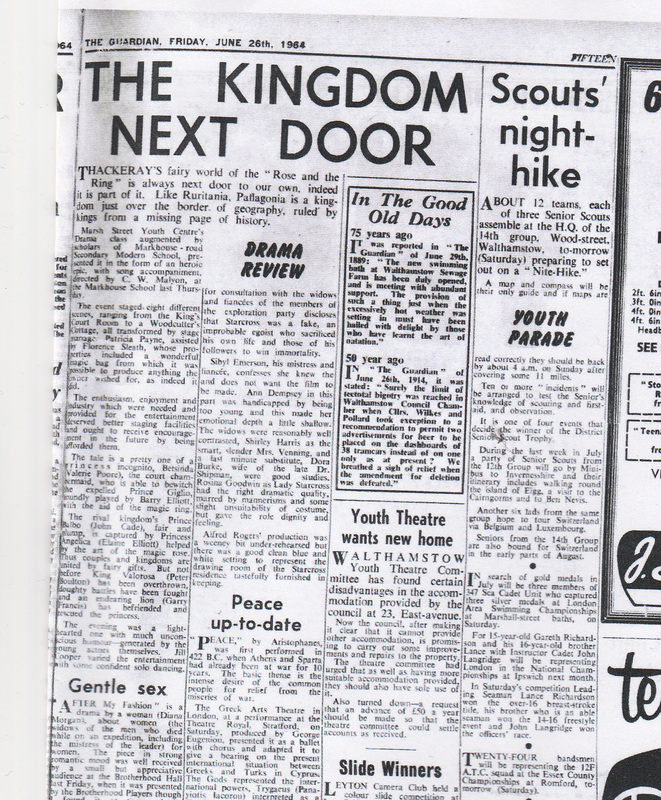 Walthamstow Guardian Newspaper Report – 26th June 1964. See typed text below. 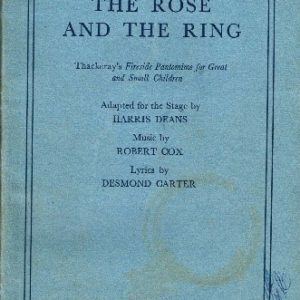 ‘Thackeray’s fairy world of ‘The Rose and the Ring’ is always next door to our own, indeed it is part of it. Like Ruritania, Paflogonia is a kingdom just over the border of geography, ruled by kings from a missing page of history. Marsh Street Youth Centre’s Drama class, augmented by scholars of the Markhouse Road Secondary Modern School, presented it in the form of an heroic epic, ranging from the King’s Courtroom to a Woodcutter’s Cottage, all transformed by Stage Manager Patricia Payne, assisted by Florence Sleath, who’s properties included a wonderful magic bag from which it was possible to produce anything the owner wished for, as indeed it did. The enthusiasm, enjoyment and industry which were needed and provided for the entertainment deserved better staging facilities and ought to receive encouragement in the future by being afforded them. The tale is a pretty one of a princess incognito, Betsina (Valerie Poore), the court chambermaid, who is able to bewitch the expelled Prince Giglio, soundly played by Barry Elliott, the aid of a magic ring. The rival kingdom’s Prince Balbo (John Cade), fair and plump, is captured by Princess Angelica (Elaine Elliott) helped by the art of the magic rose. Thus couples and kingdoms are united by fairy gifts. 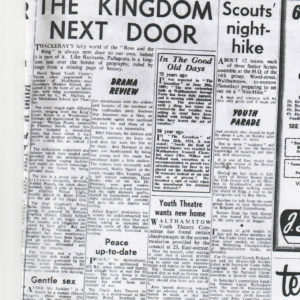 But not before King Valaroso (Peter Boulton) has been overthrown, doughty battles have been fought and an endearing lion (Garry Francis) has befriended and rescued the princess. The evening was a light hearted one with much unconscious humour – generated by the young actors themselves. ‘John Jones had led the way in this exciting development of School Club activities and he still enjoys contact with the many pupils who joined him as members of his Art Club. Cyril Malyon, who followed the pattern established by John Jones, also enjoyed fruitful contact with his pupils even after they had been left school for many years. These are examples of good teaching reaping the rewards of student loyalty and shared enthusiasm within the framework of an ever-developing community spirit. Cyril Malyon enjoyed two touching events in his School Club teaching career. 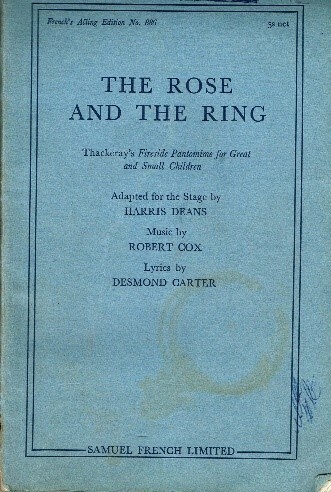 The first concerned a plan created by a small group of ex-pupils to gather together the total cast of 58, teachers included, who had performed on stage in the first of Malyon’s major productions, “The Rose and the Ring”. Five years after the original presentation in 1958, Malyon was asked to help the cast prepare for this one-off performance. In the event, all 58 original cast members, only a few still at School in its Sixth Form, presented to an invited audience a mature reprise of their first ground-breaking performance of Thackeray’s play. lt was a resounding success, so much so that the cast was asked to give a number of “encores” (of the whole play) during the following week. Cyril Malyon was not the only member of the School Community to be bowled over by this show of affection from so many great young people and ageing staff! The Borough Education Officer, Edward Potter, and a few of his staff joined the audience on the First Night, and they, too, were visibly moved by the whole event. The parents, old and current, cheered for minutes at the end of the show. The cast cuddled each other on stage, and wept with joy’.